You know how some people are brussels sprouts people and some are not. I am a for sure a spouts person. I can even remember my first introduction to the cabbage like veggie. It was about 15 years ago and honestly, up to that point in my life, I had never even seen, let alone eaten brussels sprouts (Growing up, my family pretty much ate only peas, beans, and corn). So one night at my friends and the mr's house (this was before we were dating) I stayed for dinner and there was as big bowl of steamed brussels sprouts on the table. First thing I noticed was that they kinds smelled like fart, but I wan't exactly sure if the sprouts were the culprit (they were) Second thing I noticed was that everyone at dinner seemed to be really excited, or at least not offended by the sprouts. It was kind of weird because I had a preconceived notion that brussels sprouts were nasty and nobody actually enjoys wearing them. But up close and personal with the things, they didn't seem so bad. So not wanting to seem rude, plus I was pretty curious,(and hungry) I grab a few. And then I ate them (minus the mayo that everyone was dipping them in) And then I knew. I was hooked. Brussels sprouts for life! Now here is the thing. Those first sprouts that I had, they came from a bag in the frozen food section a the grocery store. (I know cause my friend had made them) And not that I don’t like me some frozen veggies (I eat frozen veggies on the reg) but there is nothing like a fresh stock of brussles sprouts. Slightly sweet, leafy, tender and crisp… They don't even need to be cooked, which, if you are not a fan of the slight aroma that comes from cooked sprouts (kinda like fart) is great cause they don't really smell! Fresh sprouts are were it's at. 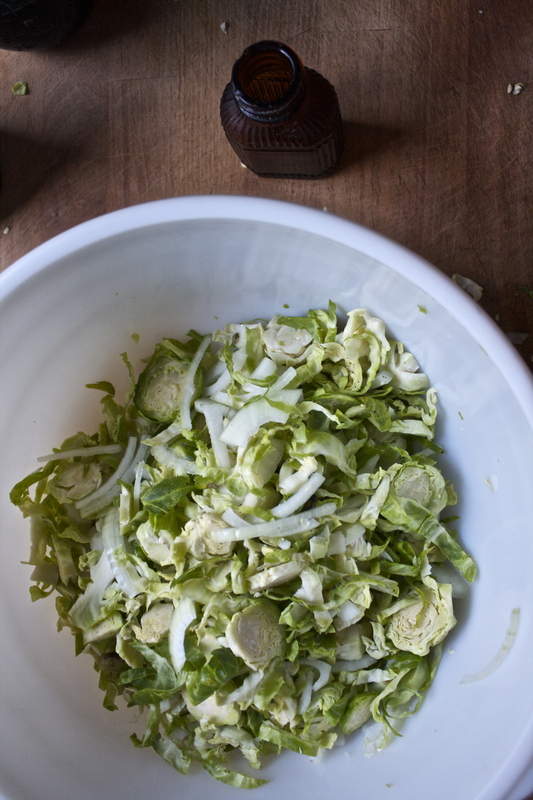 So if you are one of the cool ones (a brussels sprouts person) this salad is for you. And if you think you don't like them, well my suggestion is.. Try them again cause you probably will. And watch. They will probably turn into the new green superfood, so you are going to have to like them eventually anyway so you might as well get used to them now! The stuff. 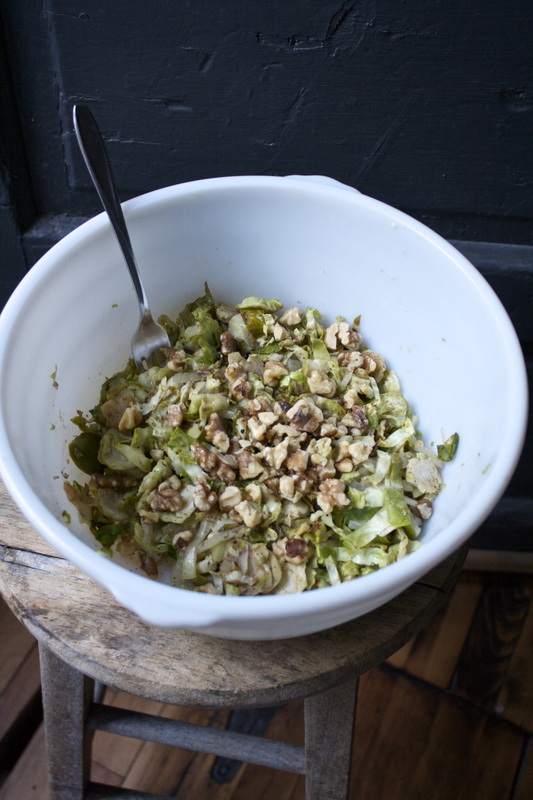 Brussel Sprouts, toasted walnuts and an onion. Also have some brown mustard, maple syrup, red wine vinegar, and some salt and pepper. Take those lovely sprouts and slice them all as thin as you can.. and do the same to the onion. Then stick it all into a bowl, sprinkle with salt and give it a toss. Set aside. Grab a big skillet and dump in the maple, mustard and vinegar. Stick it on the stove on medium high heat, constantly mixing. Keep mixing, and after a few minutes, the stuff has started to thicken and brown a bit… and smells so good! Now grab the bowl of chopped sprouts and dump the contents into the skillet. Add in a splash of water just to loosen up the sauce. Give it all a good mix, making sure that everything is evenly coated. Now let skillet sit on the heat for just another minutes or two. After a few minutes hanging in the hot skillet, remove from heat and dump the sprouts into a big bowl. To all the brussels spouts people out there.. WE ARE AWESOME! Rinse sprouts and remove any of the gross leaves then slice them as thinly as you can. Grab the onion and slice that as thinly as you can too. Toss into a bowl, sprinkle with a little salt, and toss everything together.